The traditional, lasting beauty of ornamental fence not only secures your property but enhances your surroundings. This elegant fencing option never competes with your landscape or architecture but, instead, enhances it. 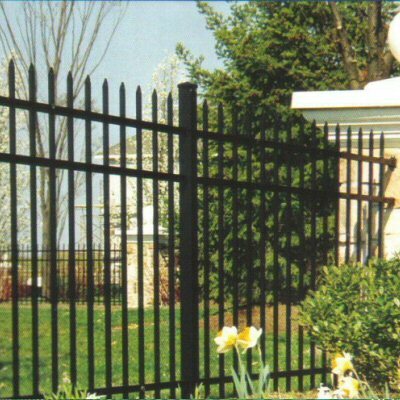 Security Fence Company proudly offers top notch aluminum fencing for your home or business. With four styles to choose from, there is surely one to satify your needs. Available in 3 colors (black, bronze, white), six heights and 6' wide sections; all covered by a limited life time warranty. SFC aluminum fence is assembled in Red Lion, PA, with the strictest quality control measures available in the industry. Fence Rails: 1" x 1"
Fence Pickets: 5/8" x 5/8"
Fence Picket Spacing: 3 13/16"
Fence Post: 2" x 2"
Contact us for Industrial and Commercial Specifications.